Discussion in 'Rise of Mankind: A New Dawn' started by Rezca, Mar 29, 2014. Every so often I come across a game that was particularly fun or interesting, and sometimes a peculiar or otherwise notable event that I felt was worthwhile enough to screenshot or jot down, but never really had any place to post it. Making a new thread for just that one event seemed a bit much, though there wasn't really much else to place it in. So, I sort of felt a new thread focusing on general discussion of the mod and any interesting or amusing events you may have encountered while playing might be a nice idea. Instead of discussing development, balancing issues, bugs and glitches, Multiplayer OOS'es and the like - which is the focus of the stickied threads - this thread would focus on merely the gameplay. Sharing tales of interesting or strange events, or glorious hard-fought battles, the discovery and conquest of a massive world... The likes. My next game I decided to try the Huge World Map scenario, and hoped that the Flexible Difficulty feature wouldn't spit in my face like it did the previous game (Half the score of Izzy and she's six times as strong as me, and it increases the difficulty on me!?) This game went so much better, perhaps largely in due to my fairly resource rich start, and I even managed to launch a successful naval assault on Pericles - who had founded three religions! Buddhism, Zoroastrianism, and Hellenism. I razed both Holy Cities, which in turn made the Aztecs upset with me since they had converted to Zoroastrianism a while back. They were Naghualist at first (I had beelined Calendar, even skipping Animal Husbandry to get there!) but quickly swapped to Zoroastiranism for whatever reason. The very next turn Aku would vassalize to me as well. This was a very very nice change of pace from the previous game where I got stomped epically. 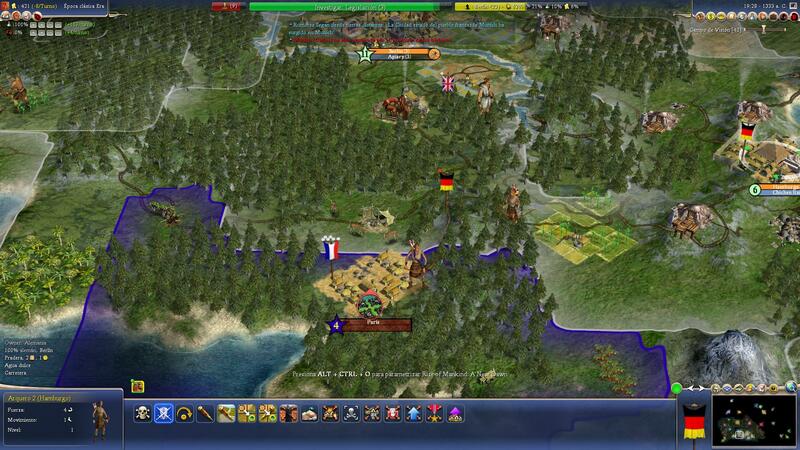 No two games of Civilization ever play the same way, even if you were to re-load the same game you just finished. So there's plenty of unique stories to be heard! To mix things up just a bit more, I also made it a Team Game (3 v 3 v 3 v 3 just because) and selected the Team Battleground mapscript since I don't often use that one. Wow. Recent revisions really did make the AI better; it stole an important wonder from me (Piazza san Marco). Or maybe Willem van Oranje has a higher wonder build chance. And that was on Warlord! Most of the standard games I'm in that Joao II shows up, he ends up running away with the tech lead but falls behind in cities and military for some bizarre reason. Not sure what's going on here, but the AI seem a bit... Slow to improve their land. Maybe it's the Always War and having three other teams being at war with them, or a side-effect of it being a team game, but Carthage NEVER hooked up their copper, Greece never hooked up their Iron or Ivory (And took 100+ turns just to farm their Rice!!!!) and most forests are still around and few resources are improved or even hooked up at all. The only exceptions are my two AI buddies, who have been furiously improving their lands. I tried a game like this in BTS once (A 10-civ FFA Always War) and the AIs were just a touch slow to improve their lands, but they didn't take *this* long to. It is possible to change a game option after the game is started? Can you teach me that magic spell, please? I play with Barbarian worlds and in the last one with Raging barb.s too, but they don't do much. Anyone else experiencing the same? Anyway, do you go for an early religion (Zoro/Kemetism), mid one (Judaism/Buddhism) or something from Confucianism onwards? I usually go for Judaism; gives really good Shrine, and the Masada is quite good at making cash. I avoid Judaism, Zoroastrianism, Budhism and Hinduism. I also go for Hellenism (the shrine is good, and Gymnasia also gos for the military city for the free promotion) and Naghualism (I like its catedral's and monestry's bonus). But most importantly get Confucianism (its holy city will become my elite military city. In my earlier games I was also going for Taoism (free promo from its monastry in military city), but since there is the Shaolin monastry I will let it for someone else. I also let Christianity and Islam for someone else. It's pretty easy actually, but not possible in MP games as far as I know. You start your game or load a game, and then enter the World Builder - in my experience, the sooner you do this the better. Then click Save map and put it somewhere, anywhere. Name it something you'll remember too - you'll have to launch this file from the Scenarios menu and not the Load Game menu. Wherever you put it to edit it, make sure you move it back to the Documents\My Games\Beyond the Sword\Saves\WorldBuilder folder when you're done and ready to play it. Exit the World Builder and exit to the main menu. Some common settings I often change are removing game options I really don't like playing with, or in the case of the Orion map which has no custom settings, I add in others I do like such as the Early Buildings and No Fixed Borders. Some scenarios only have a limited number of turns, like the Warlords scenario Peloponesian. Not fun! The 'Mars Colonization' AND scenario starts in the Future Era. I edited it so it starts in the late Modern instead so there's still stuff to research. Anyway. So assuming it is just the game options you want to change, and not anything else, select all the Option=GAMEOPTION bits and then open the WB Save you made originally. One thing I noticed, is it seems to 'reset' who has founded what religion, and when you launch the game it treats it like you're starting a new one. The former? I don't know. I edited the file 80 or so turns into the game, and saw that the tech that founds Kemetism still had the lil religion icon next to it, despite Genghis already founding it like 40 turns earlier. I never actually researched it before starting a new game to try other things, so I don't know how it'd affect things if I did research it. Probably nothing, but ya never know. Seriously, this was like 20 revisions ago when the barbarians were DEFINITELY docile on almost every difficulty and map, and I launch a Highlands map (It's the one with no world wrap and is almost entirely land with tons of mountains and hills) and FOUR AI exit the game before the Classic was even 1/3 over, and I nearly got wiped out just from Javelins alone - when I had axes and light swords! If I founded even one city, no less than 30 or 40 units would swarm it only a few turns later. By the Medieval era, there was 70+ barbarian cities across the map! I find that PerfectMongoose tends to cover large parts of the map with frozen wasteland. This may be because I choose to have relatively little ocean area. These frozen wastes are perfect breeding grounds for barbarians, though the cities of course can't really develop. As a result, I often see barbarians wandering around around the edges of the wastes, including barb' muskets and so forth. I quite enjoy having large areas of land belonging to no-one relatively long into the game. That's with neither Raging Barb's nor Barb' World options. Maybe I try it with the newest rev for trying the new wonder tag. About barbs: I usually play on Perfectworld, Planetgenerator and (recently) Smartmap. Size is giant+ (160x160 torodial). *edit* Some turns later, my exploring Galley found that the Jewish holy city was merely captured by barbs, not razed. But if Khan doesn't work fast, he's gonna get mowed over by them! There's also THIS way of changing options ingame, which is what I usually use. I made myself a screenshot with the whole numbered option list and then I know which number I need without having to retype the long python commands each time. Against All Odds: The Struggles of the Noyyau: An interactive AAR, once again about the Noyyau, in a harsh, harsh world. An Illustrated History of the Noyyau: The epic and violent history of the Noyyau people, from savages to world dominators. Completed. The BAD AAR: A quick and dirty recounting of a test game for the mod Rise of Mankind - A New Dawn. Would you be willing to post the screenshot? Sure, this one is from a very old revision though, I'm not sure if there have been changes in the more recent ones. Something that never happened to me before. I was playing German Civilization, had a nice empire, a war in the north, and an undefended city in the south coast (Munich). Well, as many other times, a galley would appear and land near the city with some troops. Nothing rare here. Munich was captured, and in the next turn, Paris appeared as a minor! Included a lot of troops that were not there before. Nothing strange, that's how Barbarian Civs work; once they have a good size city (conquered, in this case), they form a new civ. And to help them survive in an already developed environment, they get a boost in techs, units and so on, for a while at least. Well, i usually play with barb world so i know how it works, its simply that it never happened to me so fast. Barbarian Civs. Barbarian World is another option. Probably it's the first time they get such a big city. IIRC the triggering limit is size 3. As I was playing just read the rumor: The Mutapa City State (born from a barb city) has found some treasure. He already has 4 treasures in the city doing nothing with them. That raises the question: Does the AI know, what to do with this unit? It didn't use it either for culture boos or for hurrying production.